When we use the word "store" today, thoughts of shopping malls come to mind. But the Newfoundland fisherman's store was as far removed from a shopping mall as it could possibly get. 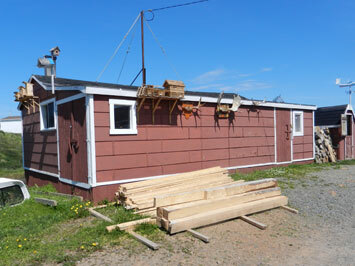 The store was one of the fisherman's outbuildings from where the fisherman and his family prosecuted the fishery. The fisherman's store was exactly what it's name suggests, a building in which things were stored. Among the items you could see in a fisherman's store years ago were fishing nets, traps, lines and hooks. In some stores these were kept in the attic, which was known as the net loft. You could also see potato prongs, pitchforks and other gardening tools. Each family grew their own vegetables. In every store there were carpenters' tools, because the early fishermen had to be carpenters, and often boat builders as well. Other things you might find in a fisherman's store in winter, which make it similar to a modern market was that food was available there. Among the food kept out in the store was pickled herring in a barrel or tub. Another of the fish items kept out in store were known as "leggies" or "rounders." These were small cod that were too small to be split, salted and dried, and had no commercial value, so they were salted and dried round for the family's consumption over the winter. The old store was also a meat market for some families, where whole carcasses of sheep, goat and pig, and maybe a quarter of cow, were hanging frozen in the sub-zero temperature in the store. A chunk was sawed off as needed. The store was often also the fishermen's workshop. Over the winter he might build a punt (rowboat) or make or repair furniture. Some fishermen's stores were dedicated to entertainment in the off-season. There men had a few swalleys, and stories and jokes were told and retold. Sometimes the stories were a competition of who could tell the biggest lie. I am happy to report that the fishermen's stores can still be seen in Newfoundland outports, and they still serve some of the same functions. 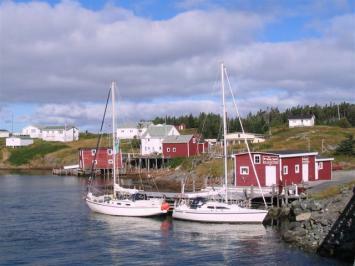 One of these belongs to Perry Rideout of Durrell's Arm, Twillingate. Perry has been a commercial fisherman since he was nine years old. Perry is a big man. His hand makes two of mine. As a boy, he was also big for his age. That was how he was able to convince Ben Legge, one of the local fishermen, that he was 13 and not nine when he took Perry fishing. He made $50 that summer, which was considerable pocket change for a nine-year-old at the time. Ben later found out Perry's true age, but took him on as crew for the next four summers anyway. When he was 15 Perry got to do what many fishermen from the island of Newfoundland did for many years - fish on the Labrador coast. He managed to get taken on as a shareman with Bruce Hiscock of Port Hope Simpson, who operated a 36-foot trap skiff out of Francis Harbour. Perry spent a number of summers fishing on the Labrador, then he began fishing from Twillingate on long-liners, as well as inshore fishing in a speedboat, mainly for crab in the later years. For the last 14 years. Perry and his mother, Elizabeth, have fished together in their 22-foot speedboat. For the last seven years he has also worked for Notre Dame Seafoods, the local shrimp processing plant. In this fisherman's store, which is across the road from Perry's house, there are similarities and differences. There are no frozen carcasses hanging from the rafters, but in the winter you may find dried cod there. Like the fishermen of bygone days, Perry is multi-talented. His store has all the usual carpenter's tools, some of which he uses to do wood carvings. He, not only, can do anything with wood, but his store also has welding equipment, and he can do anything with metal as well. One of his recent metal works was the rudder and tiller for his 28-foot skiff on which he is putting a forecastle and wheelhouse. The stove for the forecastle will be made by Perry in his store. I went out jigging fish twice with Perry in his friend's cabin cruiser while I was in Twillingate for the Fish, Fun and Folk Festival. On the second trip we were accompanied by Perry's Uncle Gary Rideout and Danny Pavia, a friend of mine from Florida. On both trips Perry took us right to Hatchet Ground, where the fish were so plentiful that we had our quota of 15 fish in short order. Next year I hope to go fishing with Perry in his skiff. Like some of the stores of bygone days, Perry's store is a party room. On most weekends during the winter, and more often in the summer men gather to have a few swalleys, tell and retell stories, and sometimes tell the odd lie. There is one difference in the modern day fisherman's store - it is not men only any longer. Women now sometimes join the men out in the store. The night I was there, along with my friends, Archie and Shirley; Perry and his missus, Donna; Dennis Burton and his wife Linda; and my wife, Lila were also there. Also there were Arthur Adey, Jason Elliott and Brian Bulgin. Jason was back home from Alberta on holidays. Dennis and Arthur also worked out west but were lucky enough this year to get a job paving the Trans-Labrador Highway. They work 28 days straight, then get 10 days off. Brian is an ambulance driver who was on call that night and couldn't imbibe. The party was still going when I left at 3:30 a.m. to walk back to Archie and Shirley's house, where we were staying. I probably should have gone home earlier with Shirley, Lila and Archie, but it's hard to leave when you're having fun out in Perry's store. As I sit down to write my column for June - Downhome's 20th anniversary issue - the thought that sticks in my mind is the old saying, you can never go home again. You may get there in body only to find the spirit of the place where you grew up has vanished. Buildings that housed your memories have been torn down, remodeled or replaced; old friends have moved away or have changed beyond recognition. This happened to Herb Bown  but not quite. 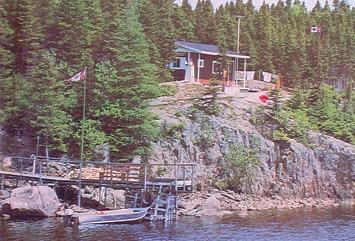 Herb grew up in Badger's Quay, Newfoundland. In 1966 he received a masters degree in electrical engineering from the Technical University of Nova Scotia (now Dalhousie). He then moved to Ottawa and launched his career. Herb's creative mind led him to accomplish great things, earning him numerous awards - including the Order of Canada - for his contributions to society. Herb received the Order for several things that came out of Interactive Visual Communications Systems, a technology he developed and patented in the U.S. and Canada in 1981. His company, Teledon, used this system as a means of sending text and colour graphics and images over the telephone system before the advent of home computers and broadband communications. A precursor to today's Internet, it incorporated a decoding device that converted text and images to electronic signals on the sending end and back to printable text and colour graphics and images on the receiving end. The system was used widely by government agencies and big business, including Bell Canada, CBC, the Toronto Star, banks, cable companies and universities. An offshoot of Herb's patent was a system for non-speaking, physically handicapped children. This technology enables the kids to communicate with others over telephone lines through the use of Blissymbols, a symbol language created by Charles Bliss. Herb and his research team became involved in a number of award-winning projects, including work on Canada's Alouette and ISIS satellite systems, which kept him very busy, but he still had salt water in his veins. He visited home often, bringing his children with him so they could appreciate the cultural experiences he had enjoyed in his youth. Over the years, one of Herb's dreams was to use his skills to benefit Newfoundland and Labrador. In 1994, he started Idon East Corporation in St. John's, which has since become a leading player in the global electronic learning industry. Among Idon's clients are the United Nations, UNICEF, Canada Post, and the World Bank in Washington, D.C. But Herb Bown is from an outport, not St. John's, and it was to the outports that he was drawn to play a more active role. Badger's Quay, however, had become modernized. The fishermen's wharves, stages and stores were gone, along with the romantic appeal. Then in 1999, Herb and his wife, Maureen Woodrow, visited Change Islands, where there were lots of stages, stores and wharves, although they were starting to fall into disrepair. Like all positive-thinking people, Herb didn't see this as a problem; he saw it as an opportunity. The couple bought a home on Change Islands and later started the Stages and Stores initiative. One of the objects of this initiative has been to repair and refurbish the old fishing premises, and the other was to provide much-needed employment on the island. Herb and Maureen oversaw the refurbishing of a number of old premises on the island, encouraging the residents to get involved. This effort has resulted in walking trail enhancement, the creation of an interpretation centre, and the Fishermen's Museum. Torraville stage in 1999, before renovation transformed it into the Burgundy Squid Cafe. Stages and Stores Incorporated has both non-profit and for-profit aspects. The company hires local artisans to produce arts and crafts products, and local skilled workers to repair and maintain historic heritage fishing properties. Artisans are supplied with materials and paid for each piece of work completed. All supplies for heritage restoration are purchased through local general stores. The markets for the crafts are local, national and international and the company's wholesale operation supplies more than 65 retail outlets in North America. The couple's enthusiasm has caught on, not only with locals, but visitors as well. Local fisherman Pete Porter, who has been collecting antiques for years through his work around the island, built a building on his property and filled it with these old items in the style of an old general store, called the Olde Shoppe Museum. He also offers Pete's Putt Putt Tours, in an old restored motorboat with a "make and break" one-cylinder engine. Thanks to Herb and Maureen's efforts, people from other parts of the province, and the world, have been buying homes in Change Islands. Among them are Beverly Stevens and David Carlson of Ottawa, who bought a home there in 2003. Inspired by a 2004 article in Downhome magazine on the plight of the Newfoundland pony, Beverly bought a pony advertised for sale in Tilting. The couple has since created the Change Islands Newfoundland Pony Refuge, and now owns a herd of 10 of these wonderful animals, with three in foal, giving readers three more reasons to visit Change Islands this summer. And while you're there, drop in at the Burgundy Squid Cafe and say hello to Herb and Maureen - they'll tell you all about the changes on Change Islands. 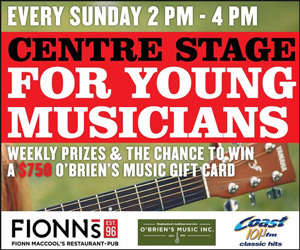 Visit www.stagesandstores.com to find out more.